Added User Self Password Reset (SPR): Now users (not only admins) can login into D365. If the admin had deposited a notification for the specific user (email or SMS), the user can perform a self password reset. 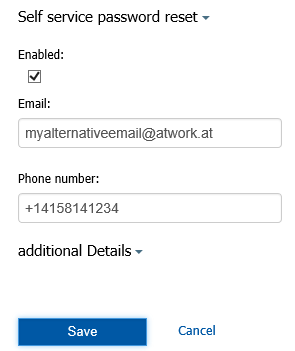 When resetting the password the user can decide if he wants to receive the necessary security-code via email or SMS (depending on the settings made by the admins). Then he receives the code and gets a temporary password on the website. With that he can login and now has to change the password to his own, individual password. This function simplifies the administrative effort when users can use this reset on their own. This feature is integrated in D365. So IT departements have no need to buy Azure premium licenses just for their users to perform self service password reset when using D365! SMS is a preview function. If used, additional costs for the SMS provider will be added - depending on the location (country) and the amount of SMS messages which is usually about 10 Cent per SMS. This switch means, that the admins of that specific OU only can assign licenses if they have enough within their OU. If f.e. the OU "Vienna" has a license quota of 10 and "Enforce" is ON, the admins only can use 10 licenses. 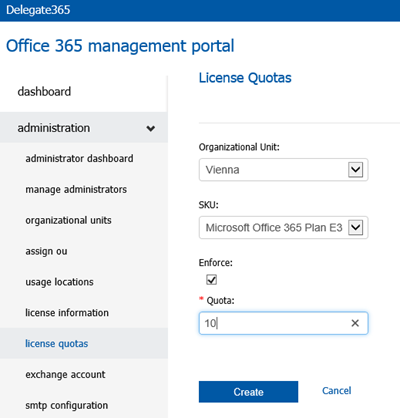 If a new 11.th user is created, this user cannot get an Office 365 license for that plan (E3). Of course the license can be removed from another user and given to the new user, but the admin only has this 10 licenses available. If the "Enforce" flag ist not set, the license quote is informational and admins can use more licenses than they have available in their OU. Anyway, if OU´s need more licenses, they can start the simple workflow for requesting more licenses from the license admin (or the portal admin). Some minor improvements in some forms. All existing customers and test tenants will be upgraded to the latest version of D365 in the coming days. Please check out our FAQ´s - we´re continuously expanding these. More to come in the next versions of D365.